Java Annotatons has been widely accepted by enterprise application developers. It really free up developers from writing down tons of boilerplate code which is used for business service invocation or basic infrastructural set up like initializing the service context or getting handle to some core runtime services etc. Reduces the boilerplate code in your business tier. Adds dynamism to your code. Greater control on the implementation part, as the logic is abstracted from the developers. A closer look at the source code of a typical web application may reveal fair amount of boilerplate code that spread across managed beans on the client tier. This repetitive piece of code mainly does the below tasks. Retrieve binding parameter values etc. Is there any better alternatives available to handle such scenarios? Answer is 'YES'. One possibility is by using Annotation. If you are building a huge system based on ADF + Java EE technology stack, It's really worth checking possibility of building custom Annotations for your application. 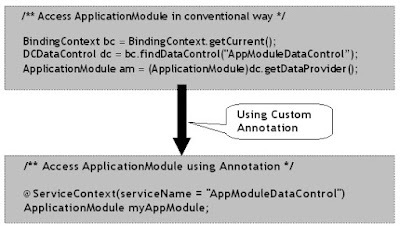 The below diagram clearly depicts how custom Annotation can be leveraged to look up ApplicationModule from a managed bean. How to build custom Annotations? I would suggest you to go through this link if you are not familiar with Annotation. Define custom Annotations based on your system's requirement. The below code snippet shows a custom annotation class (ServiceContext.java) that can be applied to fields of JSF managed bean to inject the reference of underlying ApplictionModule. Next step is to process the Annotations at runtime. As I stated earlier, the custom Annotation that we are discussing here is purely meant for JSF managed beans. So what we need here is a hook to add the custom AnnotationProcessor so that annotation defined in a managed bean can be processed based on the rule definitions at runtime. Fortunately JSF gives an option to add custom ELResolver where we can listen for bean instantiations and invocations using Expression Language(EL). Please go through this article to learn more about this topic. Annotation processing can be carried out from this custom ELResolver at runtime. Consider a use case where backing bean of a web application needs to get the reference of underlying ApplicationModule instance. Let us try addressing this use case by introducing the annotation that we generated in the above steps. Now the bean may look like as shown below. That’s it, job is done without writing any sort of boilerplate code. System runtime injects the right ApplicationModule reference to the designated variable at runtime. Few more ADF Flavored custom annotations are listed below. Apparently, Annotation is a very powerful tool. However this needs to be used very judiciously, especially if you are planning to use Annotations at runtime. I would suggest you to go for a strict performance test before releasing the feature to the end users(developers). This blog gives you an overview of building custom Annotations for your ADF/Java EE applications. The above example doesn't really replaces the ADF Binding layer, rather tries to make use of the features of binding layer and adds more dynamism to your backing bean. Annotations can be of great use if it's being used in right way, so be measured and use it judiciously. This is very interesting and valuable. While I certainly understand your suggestion to PERF test before uptaking; do you have a successful usecase where the uses outweigh perf loss? Thanks Giri for the comments. Used annotation heavily at compile time mainly for code generation. There is a link missing regarding the article about the custom ELResolver. As I can figuret out it was either deleted or moved by Oracle while restructuring the Sun site. Can you please give me a pointer on where I can find some related example.